Georgia Dunn Studio: Swap Meet Treasures and (Sorta) New Hair! 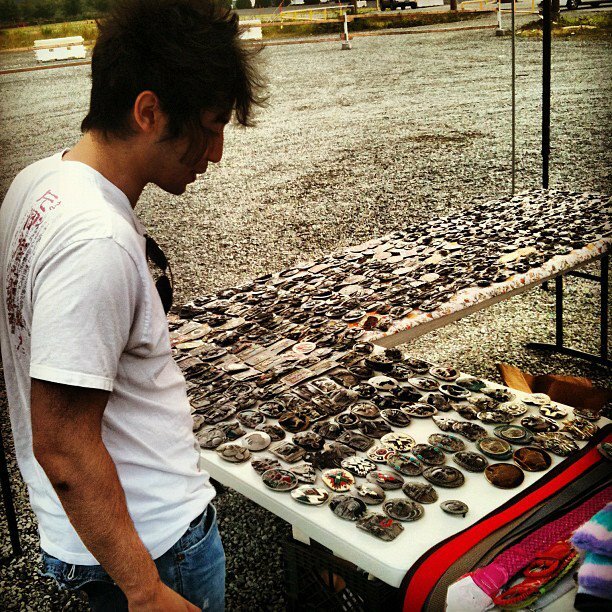 Swap Meet Treasures and (Sorta) New Hair! This morning we got up bright and early (6am) and met up with our pals Matt and Stephen to check out a local swap meet. Sure, that's kinda early for a Saturday morning. However, if you want to score cool stuff at a Swap Meet or a Flea Market you've got to get there first! Cool stuff like Tiny Chewbacca! to set up the Silent Hill swap meet. HELP ME COFFEE, YOU'RE MY ONLY HOPE! We fueled up on caffeine and began to make our way up and down rows of tables with everything from Victorian coffee grinders with cast iron cranks to complete video collections of the original Star Trek series. Photo albums, fishing poles, boxes of tools, jars of buttons. It was grand! Matt found not one, but two of the greatest belt buckles ever made. I got this 1954 Girl Scouts mess kit and handbook for $5! They're in beautiful, once loved condition! The mess kit has the initials "M.A." painted on it, and the handbook has the name "Mary Ann" written neatly on the inside cover. The little girl who owned them previously took wonderful care of them, there's not a speck of rust or a torn page! She carefully filled out her badges, camping adventures, and the quizzes inside the handbook along with the names of women who helped her along the way. NOTE THE SEVENTH BASIC FOOD GROUP, "BUTTER"
--However, mostly it's delightful. It's bringing back fond memories of my own scout days. And Ryan had some great finds of his own! I have no idea what the heck this is, but doesn't it look cool? All of Ryan's finds. Today was brought to us by the letter "Gameboy." We bought a bear of organic sage honey because it tasted amazing. Mess kits, Gameboys, belt buckles, and honey aside, Stephen found the best deal of the day. A Petosa accordion, for $50! To get an idea of what a steal this was, type in "Petosa Accordion" into Ebay. Stephen's already a talented player, he treated the seller and us to a few bars to test it out. It sounded great! All and all, a great day! I've got some new hair photos to share with you. The time came to touch it up this week. 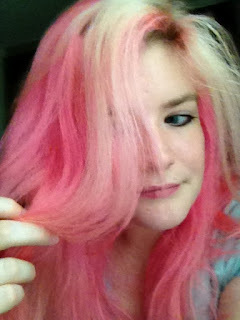 It had faded into a light pastel pink, and I liked it, but I was ready for some more color. This time I dyed it myself, and I left a lighter streak in the front ala Rogue from X-Men. New hair! Can you believe it was all as light as the front? I diluted the dye with some conditioner, for a lighter pink color. The photo doesn't quite capture it, but it was way lighter than the bottle. AND SO THIS IS HOW COOL I AM. I'm pretty excited with the results. I was easier than I thought it would be, and as it fades I look forward to trying out some new shades! That looks like a great day. And I love all of your finds! And your hair as well! The cost of staying healthy.